In the Florida Keys, there’s water, water, gorgeous turquoise water, everywhere – but where are the beaches? If you’re expecting expansive, picture-postcard beaches for sunbathing, swimming, shelling, you’ll find those on the “mainland,” but not in the Keys. Lined up like green gemstones over crystalline water for 120 miles, the islands of the Florida Keys offer awesome water activities: incredible snorkeling and diving at the magnificent coral reef, deep-sea fishing in the azure Gulf Stream, kayaking Eco tours through mysterious mangroves, exciting wild dolphin adventures, bone fishing on endless flats, reef discovery from glass-bottom boats, romantic cruises aboard sailing schooners but, contrary to expectations, there’s only a few “traditional” beaches. Planning a trip to Key West and the Florida Keys? Buy discount tickets online for Key West tours, attractions through Trusted Tours and Attractions. But, don’t be discouraged. They are there – special tucked away places; little coves where sand has collected; easily-missed spits of sand hidden among mangroves; diminutive idyllic sandy spots shaded by palms; not-so-long stretches of beach, man-made, man-enhanced, or by geological fluke, natural. Whatever the size and character of the beach, the water is crystal-clear, flat-calm, and delightfully warm. Why are there no “real” beaches in the Florida Keys? Think of it as a trade-off. The Keys have miles of spectacular coral reef just offshore; the rest of coastal Florida has miles of beaches. The island chain has the unique geographic good fortune of having the only living coral reef in the continental U.S. running parallel along its length. The reef acts as a barrier to the waves coming in from the Atlantic Ocean, preventing waves from pounding against shoreline rocks, thereby inhibiting sand build-up. So don’t look for broad beaches with rolling waves in the Keys. As a matter of fact, many Keys beaches are really tidal flats where sand has piled up, and you may have to wade out quite a way to reach deep water. Bring water shoes, as the going can sometimes be bumpy, with coral bits and rock underfoot. Some Keys beaches, like Veteran’s Memorial Park, a spit of rocky, beach area in shallow water at MM40 on Little Duck Key at the lower end of the 7 Mile Bridge, don’t look like “real” beaches at all. Others, like Anne’s Beach, oceanside at MM 72.8 on Lower Matacumbe, barely a ribbon of sand along a mangrove shoreline in turquoise wading water, are little gems, making up in beauty what they lack in sand. Both of these area along US 1, great little roadside spots to pull over when driving down the Keys. Take off your shoes, roll up your pants, and wade in! Most public Keys beaches are community, county or state parks. Like many Keys beaches, Harry Harris Park, oceanside in Tavenier at MM 93.5 in the upper Keys, is man-made. In Islamorada, Founder’s Park & Beach at MM 86.5, is a large-scale recreational facility with lots of amenities that just happen to include a bayside sandy beach. Also in Islamorada, Library Park Beach, a secluded little bayside beach known mainly to locals, is tucked into the mangroves behind, what else?… the public library! Nearby, there’s a great little bayside restaurant, Morada Bay Beach Club, where lunch and dinner are served on tables set in the sand. For something bigger and busier, try the seafood on the waterfront deck at Islamorada Fish Company, just next door. Sunsets at both are breathtaking. In the middle Keys, Marathon’s Sombrero Beach, oceanside at MM50, has a nice, curved sandy beach, good for swimming and limited snorkeling, as does Cocoplum Beach on the eastern end of Marathon. A few miles beyond the 7 Mile Bridge is the beach of the Florida Keys, Bahia Honda State Park. Here there’s plenty of white sand, long stretches of it, so put out your blanket and enjoy the beach, nice swimming, and food and sundries from the concession hut. 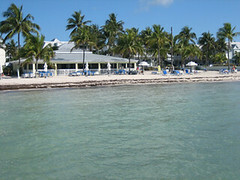 Because of its location at the end of the island chain, Key West has several substantial beaches. Smathers Beach is popular with spring breakers. The beach is man-enhanced, the water quite shallow and there’s plenty of action, with kayaking, parasailing, jet skiing, and beach volleyball. South Beach, where popular Duval Street ends at the Atlantic Ocean, is a great little sandy beach with a pleasant waterfront restaurant – very Caribbean. A local favorite, it’s the beach where Tennessee Williams hung out during his time in Key West. Higgs Beach has a nice stretch of sand, but it’s also the favored seaside hangout of homeless transients. They keep to themselves, however, gathering daily under a couple of the shaded picnic pavillions. The patio at Salute Restaurant at Higgs Beach is a great place for a breezy beachside lunch. Rest Beach, just on the other side of the White Street Pier from Higgs Beach, is a small, sea oat lined beach. Only in Key West could there be a Dog Beach. Tucked between the Reach Resort and famous Louie’s Backyard, there’s always romping, frisbee catching, swimming, and lots of shaking going on at this palm-shaded little beach. The beach at Fort Zachary Taylor State Park, located along the entrance channel to Key West Harbor, is Key West’s biggest and prettiest. Looking more like those picture- postcard beaches, it’s a real favorite for its shady Australian pines (an exotic, recently saved from destruction) and water deep enough for swimming. A small sandy spit on the sheltered side of Ft. Zach that is no longer there, was a favorite beach of President Harry Truman who spent 11 vacations at the Truman Little White House in Key West. For a real Keys treat, take a day and go out to the Dry Tortugas and Fort Jefferson National Park on the Yankee Freedom II. Seventy-five miles west of Key West, it’s a wonderful ride and a great way to spend a day. Besides the amazing Civil War-era red brick fort to explore, there are small beach areas to enjoy, gorgeous water in which to swim, and intersting places to snorkel. While in no way resembling the wide beach of Daytona, the powdery white expanse of Panama City Beach, or the remarkable shelling on Sanibel Island, the beaches in the Florida Keys are delightfully different, if a little unconventional, just like the Keys themselves.